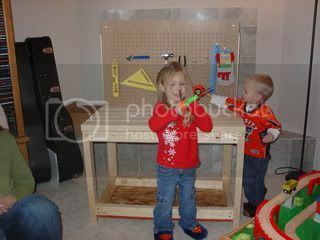 For Christmas two years ago we decided that our kids would enjoy a tool bench. 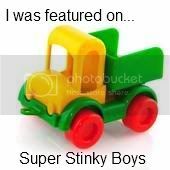 We searched the toy ones and decided that we wanted something they could use longer. So we set out to build them a real one. 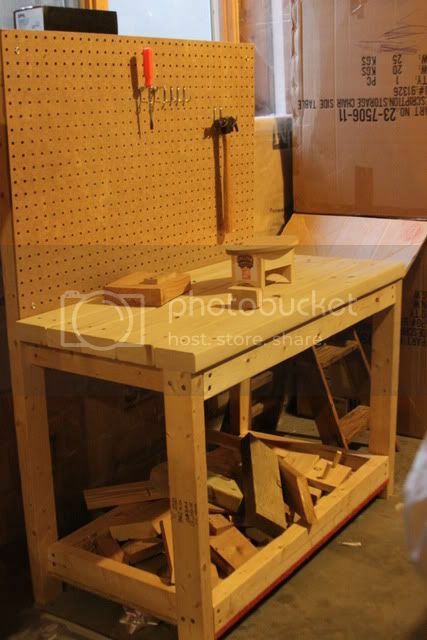 My husband and I do enough wood working projects that we figured they could build while we were building. Here is the bench. I told my husband what I wanted it to look like and even drew some pictures for him. It came out pretty much like we envisioned. The kids actually helped to build it because what fun is it to not help build your own project. 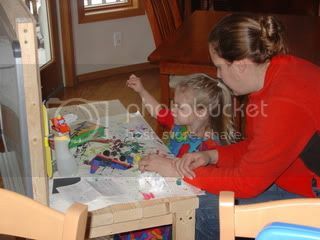 As you can see we built it plenty big so that they could use it for a long time to come. The plan was to make it be good for them to use all the way through elementary school. 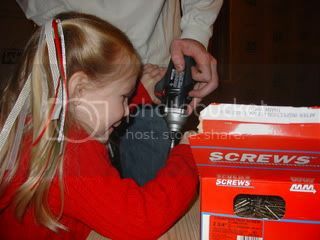 We then filled it with tools on Christmas eve. A nice starter set that had bright colors at Menards. 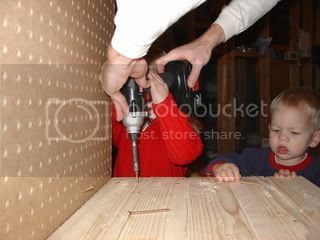 Now they hammer away on things while we work on our projects. All of our scrap wood goes in the bottom so they always have tons of wood to work with. 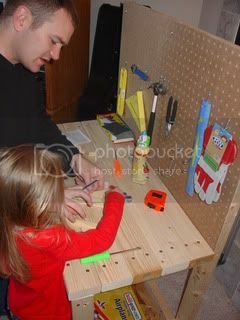 If you look closely in this photo you can see we attached a magnetic marker board on the back so our work bench doubles as an art easel as well and they can put their magnetic letters and shapes on there too. 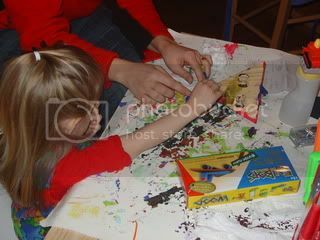 Here is my daughter painting a model airplane we built. We got them a bunch of kits from Michales crafts store. They are only $1 each. They are pretty much wood glue and paint. But they are still creating something and enjoy them and for $1. I couldn't pass up those easy projects. 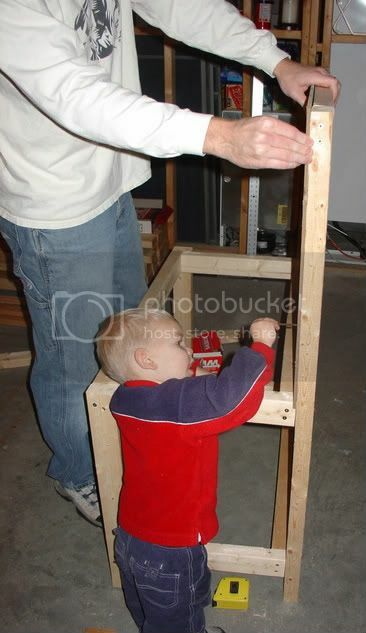 Never too early to start a lifetime love of building! Great Kara's DO think a like! This is great...love that the wee ones helped out too! Thanks for your advice on my baby garland, and the links to the blog pics...I really appreciate it!! 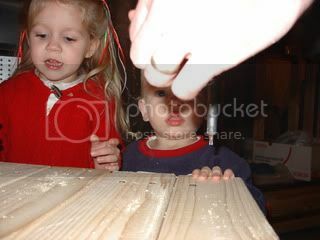 Oh yea Kara...I just learned how to hammer nails in straight at Josh's last boy scout meeting --- and helped him to build his birdhouse with the little perch facing the inside...go ahead and give me building plans. lol. Great Christmas pics by the way!! 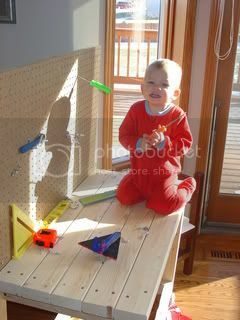 My son is thriving at his new Montessori preschool and is using real tools at the classroom workbench. I was so impressed! 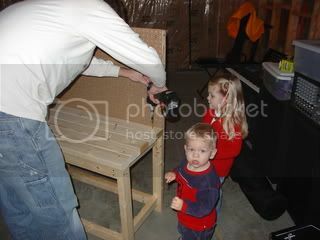 It is his favorite activity, so I would love to build him this bench for Christmas. 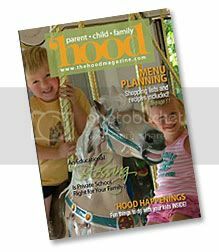 Do you have any specifications for the wood needed or lengths that you used? Thanks for sharing this!